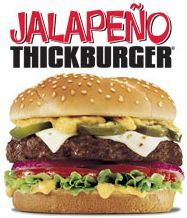 Hardee's has introduced a Jalapeno Thickburger. "Just a few years ago, no one would have dared to introduce a fast-food menu item with this much heat, but as America has become more diversified, so have American's palettes," said Brad Haley, Hardee's executive vice president of marketing. The Jalapeno Thickburger is 1/3-pound beef patty topped with jalapeno slices, peppers, pepperjack cheese and a Santa Fe sauce. It is priced at $3.49 by itself, or $5.78 for a medium combo meal. The Jalapeno Thickburger has 840 calories, 522 calories from fat, 58 grams of fat, 19 grams of saturated fat, 52 grams of carbs, 110 mg of cholesterol, 1690 mg of sodium and 30 grams of protein. Add an order of medium fries and you're up to 1360 calories and 82 grams of fat. I'll just stop there and not add a high fructose corn syrup laden cup of Coca-Cola! If you're going to try one, save a $1 and use this coupon (good thru October 2006). When I first read it, I thought he'd said heft. YUM! Can barely wait to try this one! Those food wizards at Hardee's are geniuses. Sounds good, though I bet you'd save yourself a good chunk of calories by holding the "sauce." Had a buy one get one coupon, so a coworker and I gave it a shot. Nothing too special, but worth trying if you're in a thickburger mood and like jalapenos.